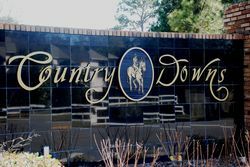 Country Downs is a well established subdivision with an in-town location but a quiet country feel. Located off Country Club Road south of Lake Mary between just north of Ronald Reagan Boulevard, the community contains 62 homes on spacious ½ acre wooded lots. Shopping and restaurants are close by on 17-92 in Longwood and Lake Mary. Commuters can access several major highways including SR 434, Ronald Reagan Boulevard and Lake Mary Boulevard.